Nick Rowe, usually a very cool guy, recently wrote a gushing post about the awesomeness of Milton Friedman. How uncool of him. As followers of this blog may know, even though I like free markets, am skeptical of big government programs, believe that the business cycle is largely a monetary phenomenon, I am not a fan of Milton Friedman. So I am going to offer some comments about Nick’s panegyric to Friedman. I can’t think of any economist living today who has had as much influence on economics and economic policy as Milton Friedman had, and still has. Neither on the right, nor on the left. Bob Lucas and Ned Prescott have not had as much influence on modern macroeconomics as Milton Friedman? I am less of a fan of Lucas and Prescott than I am of Friedman, but surely Nick can’t be serious. We are all Friedman’s children and grandchildren. The way that New Keynesians approach macroeconomics owes more to Friedman than to Keynes: the permanent income hypothesis; the expectations-augmented Phillips Curve; the idea that the central bank is responsible for inflation and should follow a transparent rule. The first two Friedman invented; the third pre-dates Friedman, but he persuaded us it was right. Using the nominal interest rate as the monetary policy instrument is non-Friedmanite, but the new-fangled “Quantitative Easing” is just a silly new name for Friedmanite base-control. Certainly Friedman looms large, and New Keynesianism is indeed a way of rationalizing the price and wage stickiness that Friedman, like so many others, relied on to account for the correlation between downward cyclical movements in nominal GDP, or in its rate of growth, and real GDP. To be sure the permanent-income hypothesis was a great achievement, for it wasn’t just Friedman’s, but the expectations-augmented Phillips Curve was anticipated by far too many people (including David Hume) for Friedman to be given very much credit. He certainly gave an influential statement of the reasoning behind the expectations-augmented Phillips Curve, but that hardly counts as a breakthrough. So of the three key elements of New Keynesianism for which Nick credits Friedman only one was (co-)invented by Friedman; the other two were promoted by Friedman, and he certainly influenced the profession, but they were ideas already out there, when he picked them up. And just what does Nick mean by “Friedmanite base-control?” That Friedman invented open-market operations? Good grief! We easily forget how daft the 1970’s really were, and some ideas were much worse than pet rocks. (Marxism was by far the worst, of course, and had a lot of support amongst university intellectuals, though not much in economics departments.) When inflation was too high, and we wanted to bring inflation down, many (most?) macroeconomists advocated direct controls on prices and wages. And governments in Canada, the US, the UK (there must have been more) actually implemented direct controls on prices and wages to bring inflation down. Milton Friedman actually had to argue against price and wage controls and against the prevailing wisdom that inflation was caused by monopoly power, monopoly unions, a grab-bag of sociological factors, and had nothing to do with monetary policy. Many economists unfortunately either supported, or did not forthrightly oppose, wage and price controls when they were imposed successively in the US, UK and Canada in the early 1970s. And Friedman was certainly right to oppose them, and deserves credit for speaking out eloquently against them. But their failure became palpable to most economists, and it is not as if Friedman required any special insight to see the underlying fallacy that Nick nicely articulates. He was just straightforwardly applying Econ 101. Imagine if I argued today: “Inflation is dangerously low. In order to increase inflation, governments should pass a law saying that all firms must raise all prices and wages by a minimum of 2% a year, unless they apply for and get special permission from the Prices and Incomes Board to raise them by less.” What are the chances my policy proposal would be accepted? I hope zero, but are we indebted to Friedman for any argument against wage and price controls that was not understood by economists long before Friedman appeared on the scene? Great men like Friedman require a great job to do, or else they can’t become great men. They also require an aristocracy, oligarchy, or monarchy, where only a few voices can get heard, or else they can’t become one of the few voices. The internet actually makes it harder to create great public intellectuals, which is probably a good thing, simply because it’s harder to stand out as great, when there’s lots of competition. The right won the economics debate; left and right are just haggling over details. The big debate is no longer about economics (sadly for me); and it won’t be held on the pages of the New York Times or in the economics journals. Actually I agree with Nick that Friedman was a great man and a great economist. He did make a difference, but the difference was not mainly the result of any important theoretical discoveries or contributions, his theory of the consumption function being his main theoretical contribution. Otherwise, he was a great applied and empirical economist, specializing in US monetary history, but his knowledge of the history of monetary theory was sketchy, causing him to make huge blunders in describing the quantity theory of money as a theory of the demand for money, and in suggesting that his 1956 restatement of the quantity theory was inspired by an imagined Chicago oral tradition, when, in fact, his restatement was a reworking of the Cambridge theory of the demand for money that Keynes had turned into his theory of liquidity preference. He hardly cited the work of earlier monetary theorists, aside from Keynes and Irving Fisher, completely ignoring the monetary theory of Hawtrey and Hawtrey’s monetary explanation of the Great Depression, which preceded Friedman’s by some 30 years. Friedman also wrote a famous paper repackaging a slightly dumbed down version of Karl Popper’s philosophy of science as the methodology of positive economics, without acknowledging Popper, an omission that he seems never to have been called on. But his industriousness and diligence were epic, he had a fine intellect and a true mastery of microeconomic theory, coupled with great empirical and statistical insight when applying theory. His ability to express himself cogently and forcefully in writing and in speech was remarkable, and he had a gift for strategic simplification, which unfortunately often led him to convenient oversimplification. Nor do I doubt that he was sincerely motivated by an idealistic dedication to his conception of free-market principles, which he expounded and defended tirelessly. Nick seems to believe that because hardly any younger economists recognize then name J. K. Galbraith, and because no one any longer advocates imposing wage and price controls to control or speed up inflation, it is obvious that the right won the economics debate. I don’t entirely disagree with that, but I do think it is more complicated than that, the terms right and left being far too limited to portray a complex reality. Galbraith believed that the book he published in 1967 The New Industrial State was going to demonstrate the market economics was a snare and a delusion, because both the Soviet Union and the US were moving toward an economic system dominated by huge enterprises that engaged in long-term planning and were able to impose their plans on unwilling consumers and workers. The most devastating review of Galbraith’s book was published in the June 1968 edition of The Economic Journal by James Meade, an eminent British economist who had been a close disciple of Keynes at Cambridge, and was a kind of market socialist, or a self-described LibLaberal. The entire essay is worth reading, but I just want to highlight a few excerpts from it. This argument for a national indicative plan is strangely overlooked by Professor Galbraith. Indeed, there is a great hiatus in his analysis of the economic system as a whole or, perhaps more accurately, in his implied analysis of what the economic system as a whole would be like when virtually the whole of it was controlled by large modern corporations. Professor Galbraith asserts that each modern corporation plans ahead the quantities of the various products which it will produce and the prices at which it will sell them; he assumes we will discuss this assumption later that as a general rule each corporation through its advertising and other sales activi-ties can so mould consumers’ demands that these planned quantities are actually sold at these planned prices. But he never explains why and by what mechanism these individual plans can be expected to build up into a coherent whole. . . . In the modern complex economy there are two major forces at work. One of these is that which Professor Galbraith rightly emphasises, namely the increased need for careful forward planning in a system which involves the commitment of large resources to inflexible uses over long periods of time. But there is a second and equally important trend, which he entirely neglects: namely, the increased need in the modern industrial economy for a price mechanism, that is to say for reliance on a system of prices as a signaling device to indicate to producers and consumers what is and what is not scarce. This increased need for a price mechanism arises because in the modern industrial system input-output relationships have become so complex and the differentiation between products (many of which are the technically sophisticated inputs of other productive processes) has become so manifold that simple quantitative planning without a price or market mechanism becomes increasingly clumsy and inefficient. Moreover, this increased need for a signaling system through prices is occurring at a time when advances in mathematical economics and in the electronic and other technologies for measuring and metering have made a great extension of the price mechanism possible. Public authorities begin to make serious quantitative cost-benefit studies where previously pure hunches would have had to serve; and we nowadays seriously consider as, for example, in electronic metering devices for charging for the use of road space by motor vehicles-extensions of the use of pricing which would previously have been considered technologically impossible. The particular brand of conventional wisdom which Professor Galbraith promotes in his recent book overlooks all these increased needs and opportunities for the use of the price mechanism. But many of the planned socialist societies are not falling into this error. Experiments which they are making in such devices as setting the maximisation of profit as the success criterion for the managers of socialised plants, in the direct use of the free market as in Yugoslavia, and generally in an increased reliance on price-mechanism indicators for many decentralised decisions constitute an undoubtedly significant development. The use of the price mechanism is, of course, not the same thing as the use of a market mechanism. A completely planned socialist economy could theoretically be run without any markets at all but with a complete system of “shadow prices” to measure relative scarcities and to be used as the decisive indicators for the adjustments to be made in the economy’s quantitative planned inputs and outputs. But in many, though not of course in all, cases an actual market mechanism will be found to be institutionally the best way of operating a price mechanism. There are many degrees and forms of such extensions of the market; for example, in some cases the prices at which transactions take place might be centrally controlled and adjusted, while in others they might be freely determined by supply and demand in the market. But in one form or an-other increased reliance on a price mechanism does imply increased reliance at least on something closely analogous to a market mechanism. I have told this particular story simply to make the point that the choice between fiscal action and monetary action must often depend upon basic policy issues which should certainly be the responsibility of the government rather than of any independent monetary authority. Perhaps the best compromise is an independent monetary authority charged so to manage the money supply and the market rate of interest as to maintain the growth of total money income on its 5-per-cent-per-annum target path, after taking into account whatever fiscal policies the government may adopt. So let me ask Nick the following: Was Meade right or left? And was he on the winning side or the losing side? Scott Sumner has been making the argument lately that a central bank with credibility can limit the growth of its balance sheet more effectively than a central bank that is not credible. The context for Scott’s claim is the chronic complaint by QE opponents that the Fed, by doing QE, has dangerously increased the size of its balance sheet, thereby creating an unacceptable risk of future inflation. Scott contends that if the Fed had been more credibly committed to its inflation target of 2%, the Fed would not have needed to create so many dollars in a futile effort to meet its inflation target. In other words, more credibility would mean a smaller balance sheet. That was a clever jujitsu move on Scott’s part, but does his argument really have a basis in economic logic? The key point here is that the size of a bank’s balance sheet depends on the public’s demand to hold the liabilities of the bank. So for Scott to be right, credibility has to reduce the amount of base money issued by the central bank that the public wants to hold. So, if by credibility we mean the confidence with which the public expects the Fed to meet its announced inflation target, then, when the Fed is undershooting its inflation target so that enhanced credibility would be associated with a rise in expected inflation, enhancing credibility would indeed imply a reduction in the Fed’s balance sheet. However, if the Fed were overshooting its inflation target, enhancing credibility would imply an increase in the Fed’s balance sheet. The credibility issue has become especially acute after the Swiss National Bank abandoned its peg to the euro last Thursday. To support the peg the Swiss National Bank was committed to buy euros without limit at a price of 1.2 swiss francs per euro, causing the balance sheet of the SNB to expand greatly. The main liability component of a central bank’s balance sheet is the monetary base; the Swiss monetary base has grown from 80bn francs when the peg was adopted in September 2011 to about 400bn francs at present. However, the Swiss monetary base has been in the neighborhood of 400bn francs for over a year, so even assuming that a new wave of demand for swiss francs, based on expectations of a falling euro and capital flight from Russia, had — or was about to — come crashing down on Switzerland, there is no reason to think that the peg had suddenly became unsustainable. Moreover, insofar as the bank was motivated by fears of euro depreciation, the bank could have seamlessly switched from a euro to a dollar peg, which might still be a face-saving way for the bank to reverse course. So here’s the question: given that there was an international increase in the demand for Swiss francs, if the SNB wanted to limit the increase in the size of its balance sheet, associated with an increase in the international demand for francs, did dropping the euro peg imply a smaller balance sheet than the balance sheet it would have had with the peg maintained? Well, the answer is: it depends. By fooling the markets, and allowing the franc to appreciate by 20% over night, the bank avoided the increased demand for francs that would have occurred had the markets expected the peg to be dropped. So the SNB was able to achieve an unexpected increase in the value of the Swiss franc without encouraging an increase in the demand for francs based on expectations of future appreciation, and to that extent, the SNB was able to reduce the size of its balance sheet. But another question immediately arises. Now that the franc has appreciated by about 20% after the euro peg was dropped, what will happen to the demand for Swiss francs? The speculative demand for francs based on expected future appreciation has probably been reduced by the sudden appreciation of the franc. However, Switzerland is now facing internal deflation, even if there is no further franc appreciation in foreign exchange markets, as the domestic Swiss price level adjusts to the new higher value of the franc. Oncoming Swiss deflation will increase the expected return to Swiss residents from holding francs while simultaneously reducing the expected return on physical capital in Switzerland, so a substantial shift out of real Swiss assets into cash is likely. Such a shift started immediately last week in the first two days after the peg was dropped, the Swiss stock market falling by about 10 percent, though Swiss equities did make up some of their losses in Monday’s trading. Given an increased Swiss demand to hold francs, the SNB will either have to increase the amount of base money, thereby increasing the size of its balance sheet, or it will have to allow the increased demand for francs to add to deflationary pressure, thereby causing further franc appreciation in the forex markets, attracting further inflows of foreign cash to acquire francs. If the SNB was uncomfortable with the euro peg, the SNB is likely to find out very soon that life without the euro peg or a substitute dollar peg is going to be even more unpleasant. If your lot in life is to supply the internationally desirable currency of a small open economy – in other words if you are the Swiss National Bank – it is the height of folly to believe that you can place some arbitrary limit on the size of your balance sheet. The size of your balance sheet will ultimately be determined one way or another by the international demand to hold your currency. If you are unwilling to let your balance sheet expand in nominal terms by supplying the amount of cash foreigners demand as they try to exchange their currency for yours, you will only force up the value of your currency, which will make holding your currency even more attractive, at least until the currency appreciation and deflation that you have inflicted on your own economy cause your economy to go down in flames. As an extended historical postscript, let me just mention the piece that Markus Brunnermeier and Harold James wrote for Project Syndicate, in which they astutely diagnose the political pressures that may have forced the SNB to abandon the euro peg. The SNB was not forced to act by a speculative run. No financial crisis forced its hand, and, in theory, the SNB’s directorate could have held the exchange rate and bought foreign assets indefinitely. But domestic criticism of the SNB’s large buildup of exchange-rate reserves (euro assets) was mounting. In particular, Swiss conservatives disliked the risk to which the SNB was exposed. Fearing that eurozone government bonds were unsafe, they agitated to require the SNB to acquire gold reserves instead, even forcing a referendum on the matter. Though the initiative to require a fixed share of gold reserves failed, the prospect of large-scale quantitative easing by the European Central Bank, together with the euro’s recent slide against the dollar, intensified the political pressure to abandon the peg. Whereas economists have modeled financial attacks well, there has been little study of just when political pressure becomes unbearable and a central bank gives in. The SNB, for example, had proclaimed loyalty to the peg just days before ending it. As a result, markets will now hesitate to believe central banks’ statements about future policy, and forward guidance (a major post-crisis instrument) will be much more difficult. There is historical precedent for the victory of political pressure, and for the recent Swiss action. In the late 1960s, the Bundesbank had to buy dollar assets in order to stop the Deutsche mark from rising, and to preserve the integrity of its fixed exchange rate. The discussion in Germany focused on the risks to the Bundesbank’s balance sheet, as well as on the inflationary pressures that came from the currency peg. Some German conservatives at the time would have liked to buy gold, but the Bundesbank had promised the Fed that it would not put the dollar under downward pressure by selling its reserves for gold. In 1969, Germany unilaterally revalued the Deutsche mark. 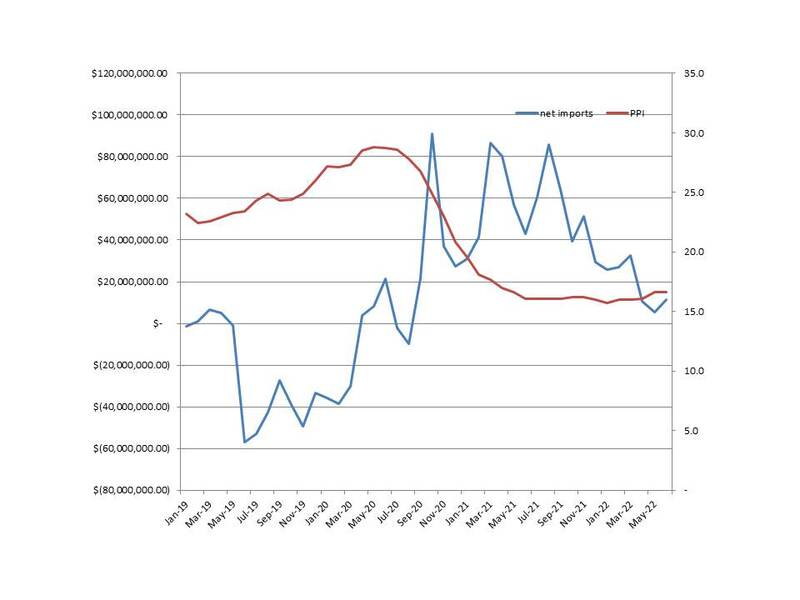 But that was not enough to stop inflows of foreign currency, and the Bundesbank was obliged to continue to intervene. It continued to reduce its interest rate, but the inflows persisted. In May 1971, the German government – against the wishes of the Bundesbank – abandoned the dollar peg altogether and floated the currency. This seems basically right to me, but I would point out a key difference between the 1971 episode and last week’s debacle. In 1971, the US was mired in the Vietnam War and an unstable domestic situation; to many observers, the US seemed to be in danger of a political crisis. US inflation was running at 4% a year, and its economy, just emerging from a recession, seemed in danger of stagnating. Germany, accumulating huge reserves of dollars, correctly viewed its own inflation rate of 4% as being imported from America. Totally dependent on the US for defense against the Soviet threat, Germany was in no position to demand that the US redeem its dollar obligations in gold. Given the deep German aversion to inflation, it was indeed politically impossible for the German government not to use its only available means of reducing inflation: allowing the deutschmark to appreciate against the dollar. It is much harder to identify any economic disadvantage that Switzerland has been suffering since it adopted the euro peg in 2011 that is in any way comparable to the pain of the 4% inflation that Germany had to tolerate in 1971 as a result of its dollar peg. Commenter TravisV kindly referred me to a review article by David Frum in the current issue of the Atlantic Monthly of The Deluge by Adam Tooze, an economic history of the First World War, its aftermath, and the rise of America as the first global superpower since the Roman Empire. Frum draws an interesting contrast between Tooze’s understanding of the 1920-21 depression and the analysis of that episode presented in James Grant’s recent paean to the Greatest Depression. But in thinking about Frum’s article, and especially his comments on Grant, I realized that my own discussion of the 1920-21 depression was not fully satisfactory, and so I have been puzzling for a couple of weeks about my own explanation for the good depression of 1920-21. What follows is a progress report on my thinking. Periodically, attempts have been made to rehabilitate the American leaders of the 1920s. The most recent version, James Grant’s The Forgotten Depression, 1921: The Crash That Cured Itself, was released just two days before The Deluge: Grant, an influential financial journalist and historian, holds views so old-fashioned that they have become almost retro-hip again. He believes in thrift, balanced budgets, and the gold standard; he abhors government debt and Keynesian economics. The Forgotten Depression is a polemic embedded within a narrative, an argument against the Obama stimulus joined to an account of the depression of 1920-21. As Grant correctly observes, that depression was one of the sharpest and most painful in American history. Total industrial production may have dropped by 30 percent. [According to Industrial Production Index of the Federal Reserve, industrial production dropped by almost 40%, DG] Unemployment spiked at perhaps close to 12 percent (accurate joblessness statistics don’t exist for this period). Overall, prices plummeted at the steepest rate ever recorded—steeper than in 1929-33. Then, after 18 months of extremely hard times, the economy lurched into recovery. By 1923, the U.S. had returned to full employment. Grant presents this story as a laissez-faire triumph. Wartime inflation was halted. . . . Recovery then occurred naturally, without any need for government stimulus. “The hero of my narrative is the price mechanism, Adam Smith’s invisible hand,” he notes. “In a market economy, prices coordinate human effort. They channel investment, saving and work. High prices encourage production but discourage consumption; low prices do the opposite. The depression of 1920-21 was marked by plunging prices, the malignity we call deflation. But prices and wages fell only so far. They stopped falling when they become low enough to entice consumers into shopping, investors into committing capital and employers into hiring. Through the agency of falling prices and wages, the American economy righted itself.” Reader, draw your own comparisons! Grant rightly points out that wars are usually followed by economic downturns. Such a downturn occurred in late 1918-early 1919. “Within four weeks of the … Armistice, the [U.S.] War Department had canceled $2.5 billion of its then outstanding $6 billion in contracts; for perspective, $2.5 billion represented 3.3 percent of the 1918 gross national product,” he observes. Even this understates the shock, because it counts only Army contracts, not Navy ones. The postwar recession checked wartime inflation, and by March 1919, the U.S. economy was growing again. Here is where the argument needs further clarity and elaboration. But first let me comment parenthetically that there are two distinct kinds of post-war downturns. First, there is an inevitable adjustment whereby productive resources are shifted to accommodate the shift in demand from armaments to civilian products. The reallocation entails the temporary unemployment that is described in familiar search and matching models. Because of the magnitude of the adjustment, these sectoral-adjustment downturns can last for some time, typically two to four quarters. But there is a second and more serious kind of downturn; it can be associated either with an attempt to restore a debased currency to its legal parity, or with the cessation of money printing to finance military expenditures by the government. Either the deflationary adjustment associated with restoring a suspended monetary standard or the disinflationary adjustment associated with the end of a monetary expansion tends to exacerbate and compound the pure resource reallocation problem that is taking place simultaneously. What I have been mainly puzzling over is how to think about the World War I monetary expansion and inflation, especially in the US. From the beginning of World War I in 1914 till the US entered the war in April 1917, the dollar remained fully convertible into gold at the legal gold price of $20.67 an ounce. Nevertheless, there was a huge price inflation in the US prior to April 1917. How was this possible while the US was on the gold standard? It’s not enough to say that a huge influx of gold into the US caused the US money supply to expand, which is the essence of the typical quantity-theoretic explanation of what happened, an explanation that you will find not just in Friedman and Schwartz, but in most other accounts as well. Why not? Because, as long as the dollar was still redeemable at the official gold price, people could redeem their excess dollars for gold to avoid the inflationary losses incurred by holding dollars. Why didn’t they? In my previous post on the subject, I suggested that it was because gold, too, was depreciating, so that rapid US inflation from 1915 to 1917 before entering the war was a reflection of the underlying depreciation of gold. But why was gold depreciating? What happened to make gold less valuable? There are two answers. First, a lot of gold was being withdrawn from circulation, as belligerent governments were replacing their gold coins with paper or base metallic coins. But there was a second reason: the private demand for gold was being actively suppressed by governments. Gold could no longer be freely imported or exported. Without easy import and export of gold, the international gold market, a necessary condition for the gold standard, ceased to function. If you lived in the US and were concerned about dollar depreciation, you could redeem your dollars for gold, but you could not easily find anyone else in the world that would pay you more than the official price of $20.67 an ounce, even though there were probably people out there willing to pay you more than that price if you could only find them and circumvent the export and import embargoes to ship the gold to them. After the US entered the war in April 1917, an embargo was imposed on the export of gold from the US, but that was largely just a precaution. Even without an embargo, little gold would have been exported. So it was at best an oversimplification for me to say in my previous post that the dollar depreciated along with gold during World War I, because there was no market mechanism that reflected or measured the value of gold during World War I. Insofar as the dollar was still being used as a medium of exchange, albeit with many restrictions, it was more correct to say that the value of gold reflected the value of the dollar, than that the value of the dollar reflected the value of gold. In my previous post, I posited that, owing to the gold-export embargo imposed after US entry into World War I, the dollar actually depreciated by less than gold between April 1917 and the end of the war. I then argued that after full dollar convertibility into gold was restored after the war, the dollar had to depreciate further to match the value of gold. That was an elegant explanation for the anomalous postwar US inflation, but that explanation has a problem: gold was flowing out of the US during the inflation, but if my explanation of the postwar inflation were right, gold should have been flowing into the US as the trade balance turned in favor of the US. So, much to my regret, I have to admit that my simple explanation, however elegant, of the post-World War I inflation, as an equilibration of the dollar price level with the gold price level, was too simple. So here are some provisional thoughts, buttressed by a bit of empirical research and evidence drawn mainly from two books by W. A. Brown England and the New Gold Standard and The International Gold Standard Reinterpreted 1914-34. The gold standard ceased to function as an economic system during World War I, because a free market in gold ceased to exist. Nearly two-thirds of all the gold in the world was mined in territories under the partial or complete control of the British Empire (South Africa, Rhodesia, Australia, Canada, and India). Another 15% of the world’s output was mined in the US or its territories. Thus, Britain was in a position, with US support and approval, to completely dominate the world gold market. When the war ended, a gold standard could not begin to function again until a free market in gold was restored. Here is how Brown describes the state of the world gold market (or non-market) immediately after the War. In March 1919 when the sterling-dollar rate was freed from control, the export of gold was for the first time legally [my emphasis] prohibited. It was therefore still impossible to measure the appreciation or depreciation of any currency in terms of a world price of gold. The price of gold was nowhere determined by world-wide forces. The gold of the European continent was completely shut out of the world’s trade by export embargoes. There was an embargo upon the export of gold from Australia. All the gold exported from the Union of South Africa had still to be sold to the Bank of England at its statutory price. Gold could not be exported from the United States except under government license. All the avenues of approach by which gold from abroad could reach the public in India were effectually closed. The possessors of gold in the United States, South Africa, India, or in England, Spain, or France, could not offer their gold to prospective buyers in competition with one another. The purchasers of gold in these countries did not have access to the world’s supplies, but on the other hand, they were not exposed to foreign competition for the supplies in their own countries, or in the sphere of influence of their own countries. Ten months after the war ended, on September 12, 1919, many wartime controls over gold having been eliminated, a free market in gold was reestablished in London. No longer propped up by the elaborate wartime apparatus of controls and supports, the official dollar-sterling exchange rate of $4.76 per pound gave way in April 1919, falling gradually to less than $4 by the end of 1919. With the dollar-sterling exchange rate set free and the dollar was pegged to gold at the prewar parity of $20.67 an ounce, the sterling price of gold and the dollar-sterling exchange rate varied inversely. The US wholesale price index (in current parlance the producer price index) stood at 23.5 in November 1918 when the war ended (compared to 11.6 in July 1914 just before the war began). Between November 1918 and June 1919 the wholesale price index was roughly stable, falling to 23.4, a drop of just 0.4% in seven months. However, the existence of wartime price controls, largely dismantled in the months after the war ended, introduces some noise into the price indices, making price-level estimates and comparisons in the latter stages of the War and its immediate aftermath problematic. When the US embargo on gold exports was lifted in June 1919, causing a big jump in gold exports in July 1919, wholesale prices shot up nearly 4% to 24.3, and to 24.9 in August, suggesting that lifting the gold export embargo tended to reduce the international value of gold to which the dollar corresponded. Prices dropped somewhat in September when the London gold market was reestablished, perhaps reflecting the impact of pent-up demand for gold suddenly becoming effective. Prices remained stable in October before rising almost 2% in November. Price increases accelerated in December and January, leveled off in February and March, before jumping up in April, the PPI reaching its postwar peak (28.8, a level not reached again till November 1950!) in May 1920. My contention is that the US price level after World War I largely reflected the state of the world gold market, and the state of the world gold market was mainly determined by the direction and magnitude of gold flows into or out of the US. From the War’s end in November 1918 till the embargo on US gold exports was lifted the following July, the gold market was insulated from the US. The wartime controls imposed on the world gold market were gradually being dismantled, but until the London gold market reopened in September 1919, allowing gold to move to where it was most highly valued, there was no such thing as a uniform international value of gold to which the dollar had to correspond. My understanding of the postwar US inflation and the subsequent deflation is based on the close relationship between monetary policy and the direction and magnitude of gold flows. Under a gold standard, and given the demand to hold the liabilities of a central bank, a central bank typically controlled the amount of gold reserves it held by choosing the interest rate at which it would lend. The relationship between the central-bank lending rate and its holdings of reserves is complex, but the reserve position of a central bank was reliably correlated with the central-bank lending rate, as Hawtrey explained and documented in his Century of Bank Rate. So the central bank lending rate can be thought of as the means by which a central bank operating under a gold standard made its demand for gold reserves effective. The chart below shows monthly net gold flows into the US from January 1919 through June 1922. Inflows (outflows) correspond to positive (negative) magnitudes measured on left vertical axis; the PPI is measured on the right vertical axis. From January 1919 to June 1920, prices were relatively high and rising, while gold was generally flowing out of the US. From July 1920 till June 1921, prices fell sharply while huge amounts of gold were flowing into the US. Prices hit bottom in June, and gold inflows gradually tapered off in the second half of 1921. The correlation is obviously very far from perfect; I have done a number of regressions trying to explain movements in the PPI from January 1919 to June 1922, and the net monthly inflow of gold into the US consistently accounts for roughly 25% of the monthly variation in the PPI, and I have yet to find any other variable that is reliably correlated with the PPI over that period. Of course, I would be happy to receive suggestions about other variables that might be correlated with price level changes. Here’s the simplest regression result. y = -4.41e-10 NGOLDIMP, 41 observations, t = -3.99, r-squared = .285, where y is the monthly percentage change in the PPI, and NGOLDIMP is net monthly gold imports into the US. The one part of the story that still really puzzles me is that deflation bottomed out in June 1921, even though monthly gold inflows remained strong throughout the spring and summer of 1921 before tapering off in the autumn. Perhaps there was a complicated lag structure in the effects of gold inflows on prices that might be teased out of the data, but I don’t see it. And adding lagged variables does little if anything to improve the fit of the regression. I want to make two further points about the dearly beloved 1920-21 depression. Let me go to the source and quote from James Grant himself waxing eloquent in the Wall Street Journal about the beguiling charms of the wonderful 1920-21 experience. In the absence of anything resembling government stimulus, a modern economist may wonder how the depression of 1920-21 ever ended. Oddly enough, deflation turned out to be a tonic. Prices—and, critically, wages too—were allowed to fall, and they fell far enough to entice consumers, employers and investors to part with their money. Europeans, noticing that America was on the bargain counter, shipped their gold across the Atlantic, where it swelled the depression-shrunken U.S. money supply. Shares of profitable and well-financed American companies changed hands at giveaway valuations. The first point to make is that Grant has the causation backwards; it was the flow of gold into the US that caused deflation by driving up the international value of gold and forcing down prices in terms of gold. The second point to make is that Grant completely ignores the brutal fact that the US exported its deflation to Europe and most of the rest of the world. Indeed, because Europe and much of the rest of the world were aiming to rejoin the gold standard, which effectively meant going on a dollar standard at the prewar dollar parity, and because, by 1920, almost every other currency was at a discount relative to the prewar dollar parity, the rest of the world had to endure a far steeper deflation than the US did in order to bring their currencies back to the prewar parity against the dollar. So the notion that US deflation lured eager bargain-hunting Europeans to flock to the US to spend their excess cash would be laughable, if it weren’t so pathetic. Even when the US recovery began in the summer of 1921, almost everywhere else prices were still falling, and output and employment contractin. And in 1922, the exchange rates for every country had risen against the dollar (peak month noted in parentheses), implying steeper deflation in each of those countries in 1921 than in the US. As David Frum emphasizes, the damage inflicted by the bright and shining depression of 1920-21 was not confined to the US, it exacted an even greater price on the already devastated European continent, thereby setting the stage, in conjunction with the draconian reparations imposed by the Treaty of Versailles and the war debts that the US insisted on collecting, preferably in gold, not imports, from its allies, first for the great German hyperinflation and then the Great Depression. And we all know what followed. So, yes, by all means, let us all raise our glasses and toast the dearly beloved, bright and shining, depression of 1920-21, of blessed memory, the greatest depression ever. May we never see its like again. Bitcoins opened today at $226.04. As I write this, they are now trading at about $178. So they have lost about 25% of their value today, and its only 1PM EST. Here’s a chart of what’s happened today. 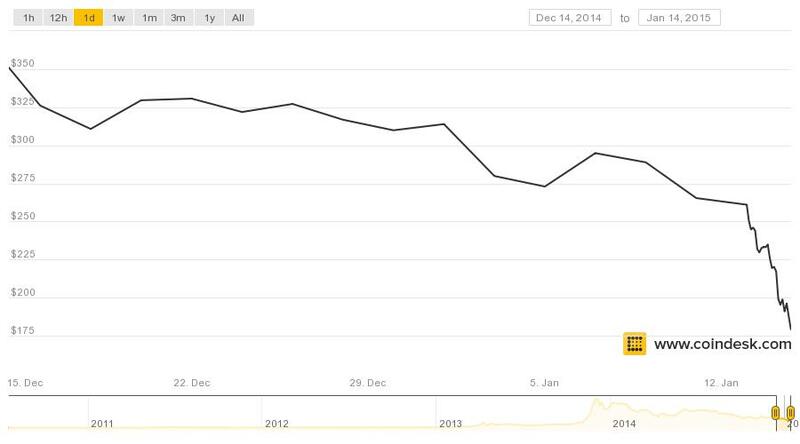 Over the last month, bitcoins have lost nearly half their value. 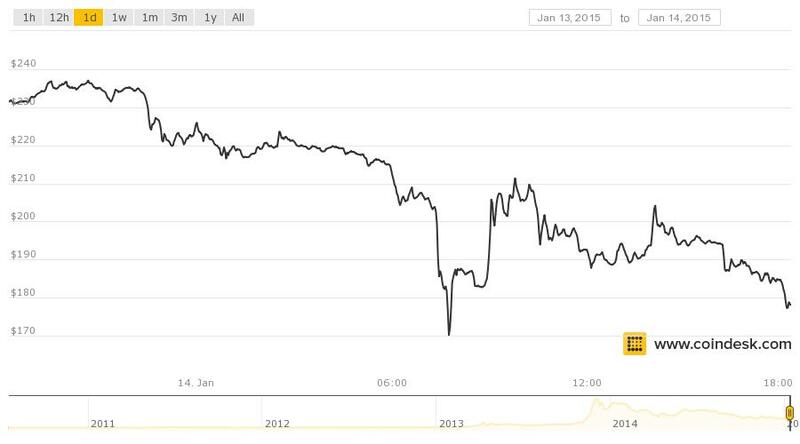 Bitcoins were trading at about $350 on December 15. Here’s a chart of what’s happened over the last month. Last April, I wrote a post asking why bitcoins aren’t a bubble. Some people, including me, didn’t take that post too seriously, but I still don’t understand why bitcoins are worth anything. I seem to have more company now. PS I have been spending a lot of time over the last 10 days thinking about the 1920-21 depression. I hope to post something later today or tomorrow on that topic. Earlier in the week, Paul Krugman wrote about the Volcker disinflation of the 1980s. Krugman’s annoyance at Stephen Moore (whom Krugman flatters by calling him an economist) and John Cochrane (whom Krugman disflatters by comparing him to Stephen Moore) is understandable, but he has less excuse for letting himself get carried away in an outburst of Keynesian triumphalism. Right-wing economists like Stephen Moore and John Cochrane — it’s becoming ever harder to tell the difference — have some curious beliefs about history. One of those beliefs is that the experience of disinflation in the 1980s was a huge shock to Keynesians, refuting everything they believed. What makes this belief curious is that it’s the exact opposite of the truth. Keynesians came into the Volcker disinflation — yes, it was mainly the Fed’s doing, not Reagan’s — with a standard, indeed textbook, model of what should happen. And events matched their expectations almost precisely. Not the cleanest dynamics in the world, but the basic point should be clear: cutting inflation would require a temporary surge in unemployment. Eventually, however, unemployment could come back down to more or less its original level; this temporary surge in unemployment would deliver a permanent reduction in the inflation rate, because it would change expectations. A temporary but huge surge in unemployment, with inflation coming down to a sustained lower level. So were Keynesian economists feeling amazed and dismayed by the events of the 1980s? On the contrary, they were feeling pretty smug: disinflation had played out exactly the way the models in their textbooks said it should. Well, this is true, but only up to a point. What Krugman neglects to mention, which is why the Volcker disinflation is not widely viewed as having enhanced the Keynesian forecasting record, is that most Keynesians had opposed the Reagan tax cuts, and one of their main arguments was that the tax cuts would be inflationary. However, in the Reagan-Volcker combination of loose fiscal policy and tight money, it was tight money that dominated. Score one for the Monetarists. The rapid drop in inflation, though accompanied by high unemployment, was viewed as a vindication of the Monetarist view that inflation is always and everywhere a monetary phenomenon, a view which now seems pretty commonplace, but in the 1970s and 1980s was hotly contested, including by Keynesians. However, the (Friedmanian) Monetarist view was only partially vindicated, because the Volcker disinflation was achieved by way of high interest rates not by tightly controlling the money supply. As I have written before on this blog (here and here) and in chapter 10 of my book on free banking (especially, pp. 214-21), Volcker actually tried very hard to slow down the rate of growth in the money supply, but the attempt to implement a k-percent rule induced perverse dynamics, creating a precautionary demand for money whenever monetary growth overshot the target range, the anticipation of an imminent future tightening causing people, fearful that cash would soon be unavailable, to hoard cash by liquidating assets before the tightening. The scenario played itself out repeatedly in the 1981-82 period, when the most closely watched economic or financial statistic in the world was the Fed’s weekly report of growth in the money supply, with growth rates over the target range being associated with falling stock and commodities prices. Finally, in the summer of 1982, Volcker announced that the Fed would stop trying to achieve its money growth targets, and the great stock market rally of the 1980s took off, and economic recovery quickly followed. So neither the old-line Keynesian dismissal of monetary policy as irrelevant to the control of inflation, nor the Monetarist obsession with controlling the monetary aggregates fared very well in the aftermath of the Volcker disinflation. The result was the New Keynesian focus on monetary policy as the key tool for macroeconomic stabilization, except that monetary policy no longer meant controlling a targeted monetary aggregate, but controlling a targeted interest rate (as in the Taylor rule). But Krugman doesn’t mention any of this, focusing instead on the conflicts among non-Keynesians. Indeed, it was the other side of the macro divide that was left scrambling for answers. The models Chicago was promoting in the 1970s, based on the work of Robert Lucas and company, said that unemployment should have come down quickly, as soon as people realized that the Fed really was bringing down inflation. Lucas came to Chicago in 1975, and he was the wave of the future at Chicago, but it’s not as if Friedman disappeared; after all, he did win the Nobel Prize in 1976. And although Friedman did not explicitly attack Lucas, it’s clear that, to his credit, Friedman never bought into the rational-expectations revolution. So although Friedman may have been surprised at the depth of the 1981-82 recession – in part attributable to the perverse effects of the money-supply targeting he had convinced the Fed to adopt – the adaptive-expectations model in the Dornbusch-Fischer macro textbook is as much Friedmanian as Keynesian. 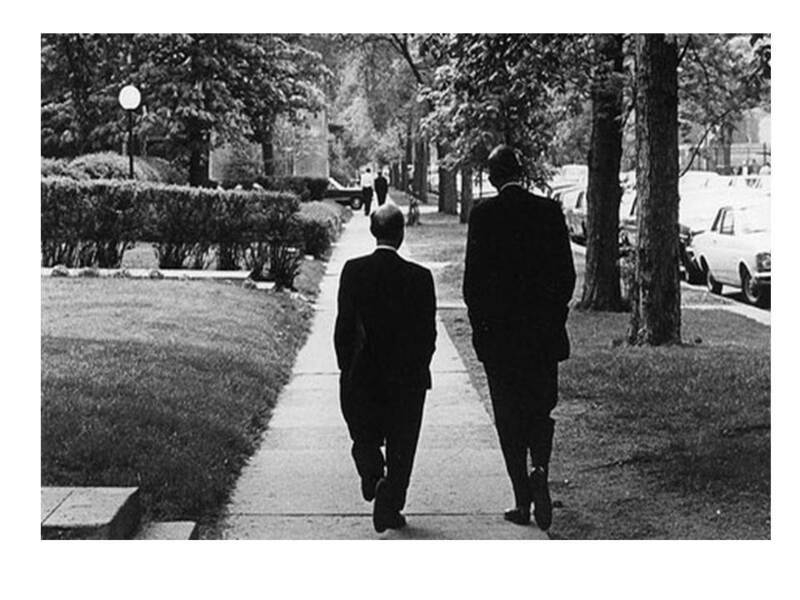 And by the way, Dornbush and Fischer were both at Chicago in the mid 1970s when the first edition of their macro text was written. By a few years into the 80s it was obvious that those models were unsustainable in the face of the data. But rather than admit that their dismissal of Keynes was premature, most of those guys went into real business cycle theory — basically, denying that the Fed had anything to do with recessions. And from there they just kept digging ever deeper into the rabbit hole. But anyway, what you need to know is that the 80s were actually a decade of Keynesian analysis triumphant. I am just as appalled as Krugman by the real-business-cycle episode, but it was as much a rejection of Friedman, and of all other non-Keynesian monetary theory, as of Keynes. So the inspiring morality tale spun by Krugman in which the hardy band of true-blue Keynesians prevail against those nasty new classical barbarians is a bit overdone and vastly oversimplified.